For budget travelers trying to knock out Atacama Desert sights without weeks of planning, this guided tour is a great choice. 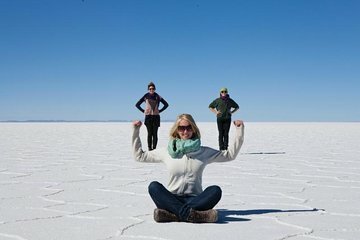 Accommodation, transportation, and meals are included so you can head to the places you most want to see with ease, including the Red Lagoon, Chiguana Salt Flat, and Uyuni Salt Flats. This tour starts in San Pedro de Atacama and drops you off in La Paz, so you can continue on your journey without missing a beat. Please note that these fees must be paid in Bolivianos and are subject to change without prior notice. Please keep in mind that tipping is common in Latin America and would be greatly appreciated. This trip takes place at a very high altitude. The salt flats are around 5,000 meters above sea level, and most guests will be able to feel the effects. We recommend acclimating yourself to above 3,000 meters before the trip and bringing along medication for headaches and tablets for altitude sickness in case you feel unwell. And remember, the real key is to drink lots of water! The reality of visiting a remote area and immersing yourself in nature is that you will be far from modern facilities and the services will sometimes be slow and quite basic. Due to the harsh terrain, vehicle breakdowns are not uncommon, but the drivers are very used to fixing them and wait times are rarely excessive. The accommodations will be very basic, with cots and shared rooms, and the electricity and running water in the National Park are not as dependable as they are back at home. Toilet facilities may have a small local cost. Make sure to bring snacks, some water, toilet paper, and plenty of warm clothes. That said, with some patience, preparation, and an appetite for adventure, this trip will certainly be a positive and unforgettable experience. like a scarf and wool hat for the chilly evenings.